Are newspapers actual fans of web analytics? Cherubini et al. state that journalists nowadays use web analytics fanatically, so that they can target their audience even better. But which journalists are we talking about? The young ones at the internet department? It seems that most Dutch newspapers aren’t fully ready yet to make the transition to the web. The fact that those newspapers still publish boringly written articles, put vague headlines above them, use few (good) photos and don’t invest all too much in video productions and other forms of journalism, shows that they’re still not web-savvy enough (I know it’s not an existing word) to make efficient use of the analytics that they have. And often the journalists who just write for the websites of the newspapers, have difficulty communicating about strategies with the rest of the editors. Because still a lot of journalists are stubborn or uncomfortable with the idea that the nostalgic paper will likely disappear, and with that their craft or the ambition. In that sense, web analytics and internet as a whole is still ‘het ondergeschoven kindje’ in Dutch journalism. Measuring is not enough (and of course, not the only important thing). You have to consider it as feedback, that you can then use to actually improve your core business. Are our newspapers for the mass? Hallin and Mancini’s paragraph about the development of mass press is interesting to me. It made me think about the definition ánd the criteria of mass press. Stated, for example, is that the newspapers of Southern Europe are addressed to a small, politically active elite, in contrary to “our” newspapers (page 3 from the pdf). That, the rate of male and female readers and the political parallelism that’s been scetched are true, but it may be true for “our” newspapers as well. Dutch newspapers do indeed suggest that they’re for everyone, it’s also visible in the subject matters and design. But, isn’t it a subtle mask, and aren’t our newspapers in reality just as elite, targeted to a very specific niche and a bit ideological too? The unique selling point of weekly paper De Groene Amsterdammer is clearly the leftist opinionated analyses, but the same could be said about the bigger newspapers: they choose the same subjects, often the same point of view and definitely the same audience. Trump and Wilders’ criqitues are being criticized or structurally ignored, so in a way they’re right about “the media”. Minorities in the Netherlands feel neglected or misunderstood. The lack of diversity is a huge problem, which it wouldn’t if the papers actually would be “for the mass”. And on the other hand are the big South European papers even more “massive” than ours. For example, they write more about entertainment news and “easy” subjects. So the difference may not be so big as we like to think. I agree with scholar Vicky Mayer, who states that media production studies and audiences have very much in common and should be more in conversation to be able to share knowledge more. Also, people outside this industry should, in my humble opinion, get more access to the theories about discourse and negotiation, for example of Stuart Hall. That way people could actually reflect on their own “media behavior”. We see the different discourses now in the discussion about racism, white privilege, Black Lives Matter and diversity. Sunny Bergman’s documentary Wit is ook een kleur, for example, revealed people’s positions and discourses about the subject so well. You see here that a media production, is received very differently by different people, which means that meaing is created by the consumers, not by the producers (which could have another goal). In both fields, media production studies and audience studies, should not forget that their truth is somewhere in the middle. Can we even be creative without commerce? The texts of this week were about the developments of new (and old) media. It gives me the impression that a lot of scholar nowadays seem to be either too optimistic (a revolution! People have the power, make their own content!) or too pessimistic (commerce commerce commerce). Either way, they seem a bit naïve. Creating content as an individual is nothing new, the first movies ever were based on the same initiatives as YouTubers have now. But nothing is free. Thinking commercially is needed in order to survive as an artist: seeing commerce as something negative would be too idealistic. It’s better to admit that commerce is the fuel that makes our world turn. You might as well use this in your advantage as a YouTuber: survive on your own, learn to deal with it ánd learn how to run your own business. The differences between old and new media, commercial media brands and ‘alternative’ media brands are way smaller than people like to admit. Your favourite indie band and the 13-year old kids on YouTube are maybe even less revolutionary than a passionate, simple soul that works for the pulic broadcast. Bantz, Charles R., McCorkle, Suzanne and Roberta C. Baade. “The News Factory.” Communication Research 7.1 (1980): 45-68. 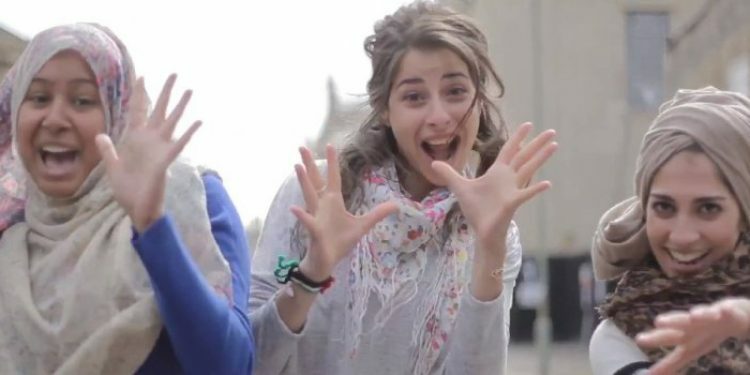 Should we write more positively about muslims? No! Just when I was reading the articles of Shuck, Schuefele and Chong about agenda-setting and news frames, I got a call from an NRC journalist about exactly that: framing. He published an article about a new research which stated that the framing of muslims is too negative and could lead to more prejudices and discrimination. The journalist asked if I agreed. I didn’t, not fully. And the final article made think about this. I didn’t agree with Schuefele either, who explained only quantitive researches. It’s the same reason I don’t fully agree with the new research in the paper: yes, we talk about muslims a lot, but that’s not the problem. It’s not only about counting the news and the words. The negativity about Islamic issues is also not the problem, because there ARE a lot of things happening in the Middle East, and unfortunately we HAVE to deal with terror attacks, by “muslims”. The researchers see writing more positively about muslims as a solution. Either way, since a journalist published this, we can assume that framing news, apparently is a very conscious process. And if this is true, I don’t want it. In both cases will the news is too formed and too forced, and I believe that that has negative consequences: citizens are not fully informed either way. Rather, we should publish more about the diversity in islam, so we generalize less and see the different aspects to it. Chong’s article in this way was more open and refreshing, since it doesn’t have so much assumptions about what “the media” strictly do (negative) and should do (positive). Scheufele, Dietram A. (2000). ‘Agenda-setting, priming, and framing revisited. Another look at cognitive effects of political communication.’ Mass Communication and Society 3 (2&3), 297-316. Ultimate superstar Rihanna has launched a new beauty brand called Fenty Beauty last week. Now, a mogul expanding her imperium is nothing new under the sun. But especially sociologist Galtung’s article ‘The Structure of Foreign News’ and lecturer Harcup’s reactive article ‘What Is News?’ made me think of the interesting role of celebrities (and celebrity news) on the public debates in society. Fenty Beauty became very big news and has received hundreds of positive reviews. Not only because of the quality of the products, but because it’s seen as a solution for the consistent lack of diversity in the beauty world. Magazines have written about the “beauty industry historically failing to represent people of colour in ads and with products”. Rihanna and other dark skinned artists have “taken matters into their own hands”. Rihanna brought out 40 shades of foundation, while older brands approximately have 10 to 20. This makes the products suitable for an audience as wide as possible. We know from all the responses that dark skinned women finally feel included, heard and represented. Inclusivity, or being pro-black is sometimes confused for selective inclusivity. 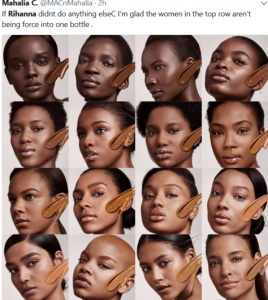 Fenty though, is not only and all about blackness: it’s so inclusive, it has even foundation shades for albino’s! Girl! At the same time it’s embarrassing for existing Western beauty brands, who were proven wrong about dark shades “not selling”, muslim women not being able to model, and so forth. So is this celebrity news story, which seems so small and irrelevant, an expression of the need for positive identification, as Galtung would state it: Rihanna represents a unheard diverse group of fashionable and educated women, who can finally play confidently with makeup. Rihanna, as an “elite”, doesn’t represent herself, she represents “coloured”, fashionable and educated women. That’s one of makeup’s powers.